What to do with your Race Bib? If it is your first race or you are veteran of running many events here are a few things to remember when pinning on that bib. First assume that some portion of the bib is being used to produce the finish results, this may be the Tear Tag at the bottom or a chip fastened somewhere to the bib in either case before you go bending the bib or worse tearing things off be sure that it is OK to be doing things to that race bib. 1. Wear bib somewhere on your front side (NEVER ON THE BACK). If you are being manually timed you may be viewed as a bandit at the finish, if being chip timed and your chip does not read, they do not always read, then a camera if being used to view any missed bibs will never see yours. 2. Pin it on so that the tear tag at bottom is not pinned, assume that the tear tag is going to be pulled off when you get to the finish. 3. 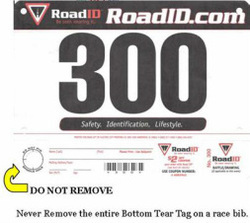 NEVER remove a Tear Tag from the bottom of a race bib. This may be part of the scoring system being used in a race to produce official results.